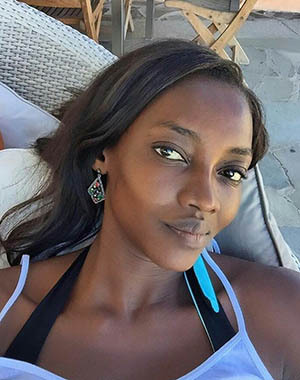 Oluchi Onweagba was born in Lagos, Nigeria, on August 1, 1982, is an Nigerian supermodel. She began her modeling career at the age of 17, she won the "Face Of Africa" contest in 1998. Oluchi appeared in the Sports Illustrated Swimsuit Issues in 2005, 2006, 2007 and 2008. She walked in the Victoria's Secret Fashion Show in 2000, 2002, 2003, 2005, 2006 and 2007. She is a one of the tallest models in the fashion industry. Started her own modeling agency in South Africa in 2008. She was the host and head judge of Africa's Next Top Model (2013-2014). She married Italian fashion designer Luca Orlandi in 2006, they have two sons. She made her big screen debut in action comedy film After the Sunset (2004) in role as Mooré's Girl, opposite Pierce Brosnan and Salma Hayek. Pop Magazine Cover, V Magazine, Elle South Africa Cover, Vanity Fair, Arise Magazine Cover, Love Magazine, American Vogue, Harper's Bazaar U.S., Marie Claire, Allure, Nylon. Appeared in advertising campaigns for JCPenney, Bergdorf Goodman, Nordstrom, Macy's, Banana Republic, Gap, Express, L'Oreal, Coca-Cola, Born Free Charity Campaign. Christian Dior, Alessandro Dell'Acqua, Jeremy Scott, Helmut Lang, Fendi, Anna Sui, Givenchy, Kenzo, Giorgio Armani, Céline, Nina Ricci, Gucci, Carolina Herrera, John Galliano, Missoni, Tommy Hilfiger, Chanel, Bottega Veneta. Represented by agencies New York DNA Models and London Storm Model Management. I think I reflect a lot of African beauty. I am African. And I am beautiful. You do not have to be famous to have a makeup artist. When you think of models you have to think of sample sizes. It’s existed through the age of time. Models are like mannequins. You have to be tall enough. Weddings are a huge tradition in Nigeria. Our clothes are mostly customized with authentic local fabrics like aso-oke and lace. The style of New Yorkers and Nigerians couldn’t be more different. New Yorkers are effortless and cool, while the Nigerian woman is more feminine and embellished.